story by Marisa McClellanThe first time I tasted pumpkin curry was 10 years ago, at a place in Portland, Ore., that’s half restaurant, half Laundromat. The pumpkin cubes were perfectly tender and the coconut and yellow curry broth were habit-forming. Ever since, pumpkin curry has been one of my primary food obsessions. I recently discovered that Circles Contemporary Asian in the Newbold neighborhood makes an excellent one, but before theirs, my options were limited. In order to satisfy my pumpkin curry needs, I learned to make it myself. Though these ingredient lists look long, this is actually shockingly easy to make. The curry paste ingredients get blitzed in a food processor, but can be made in large batches and frozen. It’s actually better if you whir it together a little ahead of time, so that the flavors have time to mingle awhile. Aside from this dish tasting so good, the best thing about it is how easily it can be veganized. Skip the shrimp or Tom Yum in the curry paste, omit the fish sauce and use vegetable stock and tofu. Served over basil-flecked jasmine rice, it’s a beautiful dish that everyone sitting around your table can enjoy. Combine all ingredients in a food processor and blend until mostly smooth (it won’t be perfect, and that’s OK). Add a bit of water if it needs a little extra lubrication. Scrape sides of processor down several times during blending. Excess curry paste will keep up to one week in the refrigerator. For longer storage, freeze. Heat oil in a large Dutch oven until it shimmers. Add onions and cook 2-3 minutes, until they’ve browned just slightly. Add the curry paste and stir to combine. Add coconut milk, stock and fish sauce, and stir until the curry paste is spread throughout. Add pumpkin cubes and simmer with the lid off until tender. This can take 10-25 minutes, depending on the type of pumpkin you use. 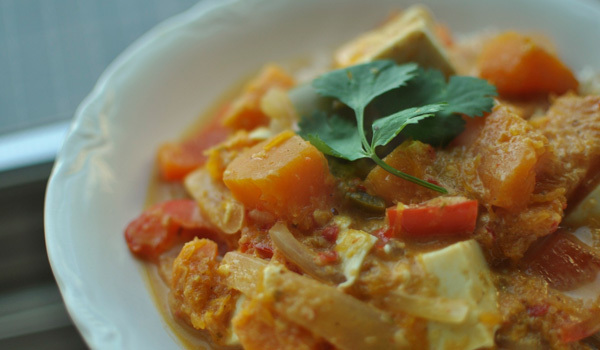 When pumpkin is tender and sauce has thickened slightly, add the chopped peppers and the tofu or chicken. Cook until the peppers and protein are heated through. Just before serving, stir in chopped cilantro. Wash the rice, changing the water until it is no longer cloudy. Pour rice into a sturdy pot and add water. Place pot over medium-high heat and bring to a boil. Once boiling, reduce the temperature and simmer until rice is tender and water is gone. This should take about 20 minutes for white rice and 45 for brown. Stir in the chopped basil. The heat will release the fragrance of the basil and make for incredibly aromatic rice. 1. Set your pumpkin down on a large, solid cutting board. If the bottom of your pumpkin is rounded, slice a bit off the bottom so it sits flat. 2. Using a large, sharp knife, make a cut from north to south pole on one side of the pumpkin. 3. Make a matching cut on the other side, so that when you finish cutting, the pumpkin breaks in two. 4. Scrape the seeds and guts out of the pumpkin. 5. Once scraped clean, cut each half into eight equal pieces. 6. Lay each piece on its side and cut off the rind. It should look a little like a wedge of cantaloupe when you’re done. 7. Cut the wedges into chunks. Marisa McClellan is a food writer, canning teacher and dedicated farmers market shopper who lives in Center City Philadelphia. Find more of her food (all cooked in her 80-square-foot kitchen) at her blog, foodinjars.com.